A Jo is a round stick made of oak. It is 128cms in length and 2.4cms in diameter. Jodo is a traditional martial art of Japan; it is aimed at self-defence against an attack; it enables you to suppress your enemy’s offence: and its spirit is to give him a lesson without inflicting a wound. You can develop various virtues such as good manners, trustworthiness, sincerity, modesty, etc. You can build a strong physique and become a person of agile action. You can have a fine carriage. You can improve your abilities to make right judgement and right decisions, and handle problems with self-confidence. You can have good human relations and develop a spirit of co-operation in the society. Jodo is a martial art by use of the jo, which looks like a mediocre weapon; however, Jodo turns it to a variety of weapons such as the spear, the halberd (Naginata) or the sword once it is brought into action. 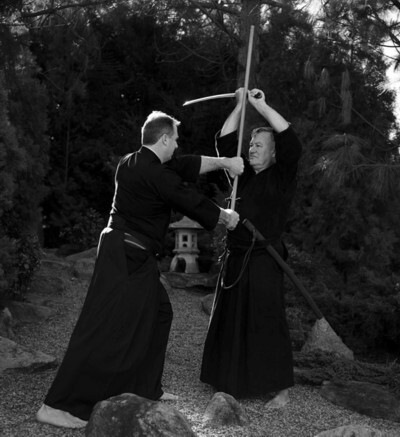 Jodo techniques include thrusting, parrying, and striking; Jodo is noted for its equal handling of the jo on either side of the body. Jodo kata (forms) are called SHINKEN KATA (real sword forms); All Japan Kendo Federation has selected twelve forms out of sixty-four originals and designated them as A.J.K.F. Jodo kata. In the practice of Jodo, it is essential that you follow instruction precisely, always in an alert and concentrated mind as if you were engaged in a real life-or-death combat. By doing so, you should be able to master those kata in terms of not only appearance but also spirit, and eventually you should reach the level of skill that you can participate in a match.